The use of chemical or natural substances on fruits and vegetables is a common practice and makes it possible to address the quality of harvested produce. 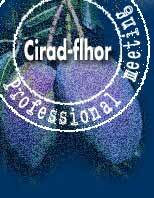 It is particularly useful for tropical fruits and vegetables whose transport sometimes takes a long time. Appropriate substances and techniques can be used so that this produce conserves appearance and organoleptic qualities that meet consumer demand. The use of post-harvest treatments is subject to regulations in both the sphere of food, with regard to food additives, and that of agriculture, with regard to the use of pesticides. The use of pesticides in agriculture is governed by a series of very precise legislative acts, for reasons of the health and environmental risks inherent in the unsuitable use of such products. To determine the risks related to pesticides and issue marketing authorisations with full knowledge of the facts, the Ministry of Agriculture possesses several decision-making and concertation authorities, and especially the Commission of pesticides for agricultural use and similar products (made up of experts on the subject) and the Committee for the registration of pesticides for agricultural use and similar products (consisting of representatives of the various ministries concerned and the Institut national de la recherche agronomique). Marketing authorisations are issued by the Ministry of Agriculture and Fisheries after an opinion from the Commission of pesticides for agricultural use. The authorisation specifies the uses authorised by the Registration Committee. It also lays down the dosages to be used, the maximum residue limits (MRLs) and the pre-harvest interval for products used in the field. Furthermore, the pesticides examined must consist of the active substances entered in a community positive list (Decree of 5 May 1994 transcribing the European directive 91/414/EEC into French law). A list of products with marketing authorisations is available from the Direction Générale de l'Alimentation, sous direction de la qualité et de la protection des végétaux. It can also be consulted on the Internet (http://www.agriculture.gouv.fr/wiphy), making it possible to be informed about the frequent changes in marketing authorisations following meetings of the Registration Committee and to obtain information about the utilisation specified in the authorisation and certain MRL data. The marketing authorisation and the uses that it allows are French legislative acts and applied in metropolitan France and overseas departments and territories in accordance with regulations specific to them. Only a few products are registered for post-harvest use for crops likely to interest producers in the tropics.No pesticides are registered for the post-harvest treatment of the other classic tropical crops (especially pineapple, avocado, mango, etc.). Marketing authorisations are issued for 10 years, at the end of which the manufacturer can request a renewal for 10 years. If this application is not made, the product is no longer registered. Benomyl thus lost its authorisation for post-harvest treatments after the abandoning of the request for renewal of the authorisation by the firm producing the commercial product previously used. Through these commercial products, bitertanol has had provisional clearance for sales for 2 years, renewable once for the same period of time, and that may finally lead to a marketing authorisation (source: DGAL/SDQPV bureau des produits antiparasitaires et des matières fertilisantes). The marketing authorisation also specifies the MRLs that are partially listed at the 'e-phy' website. 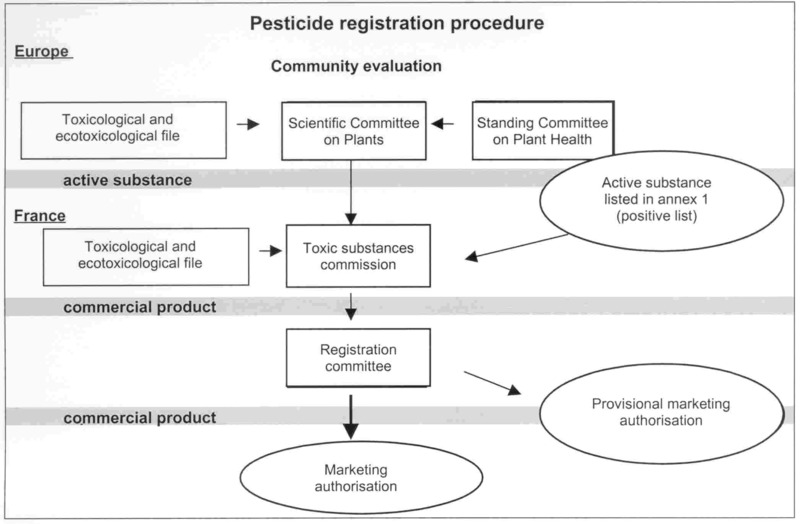 More precise information is available in the specific legislation (Order of 5 August 1992 concerning maximum pesticide residue levels, available in the series entitled Documentation législative en production et protection des végétaux, published by the Mission de Coopération Phytosanitaire). This information on MRLs is particularly useful for producers of tropical fruit and vegetables and importers of produce from third countries that might use products that are not registered in France and in Europe for post-harvest treatments, insofar as treatments are applied at production. Care must be taken that these uses controlled by the producer countries simply respect the MRLs in force in the importing country. In foods, the use of additives is regulated by a set of legislation whose key act is the order of 2 October 1997, last amended by the Order of 31 July 2001, abrogating to a considerable extent the Order of 14 October 1991 concerning the additives permitted in the manufacture of foodstuffs for human consumption. This act lists all the additives that can be used in foodstuffs and, when applicable, the maximum quantities authorised according to the use and the foodstuff concerned. unprocessed foodstuffs are those that have not undergone any treatment causing a substantial change to their original state. However, they may for example have been divided, separated, sliced, boned, chopped, flayed, peeled, moulded, cut, washed, pared, deep-frozen, frozen, refrigerated, ground or shelled, packaged or not.' (Order of 2 October 1997 - Art. 13). Annex III B. Foodstuffs in which a limited number of additives in Annex III A can be used (Annex III A groups the additives generally authorised in foodstuffs but not applied to unprocessed foodstuffs except for exceptions specified for gases). Annex III C. Preservatives and antioxidants authorised under certain conditions Part 1: sorbates, benzoates and p-hydoxybenzoates Part 2: sulphur dioxide and sulphites Part 3: other preservatives. Annex III D. Other permitted additives. Annex IV. Permitted carriers and carrier solvents. 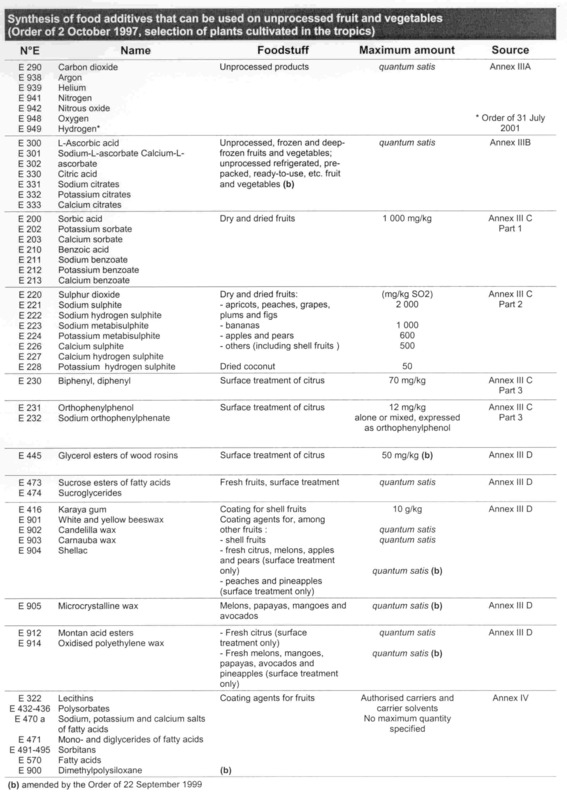 The presence of references to the pesticides that can be used in post-harvest treatments in two different categories of acts complicates their interpretation. Information concerning the evolution of authorisations are not systematically mentioned in the Journal Officiel and search for information must take into account the catalogue of authorised substances published by the DGAL, which alone provides regularly updated information. Some more specific orders may complete broad-based acts. In the case of tropical fruits, an order concerns litchi, whose shell is not edible. It gives information concerning the use of SO2 and specifies that the residual level in the shell may attain 250 mg/kg (Order of 1 July 1998 authorising the use of sulphite as technological aids for the post-harvest treatment of litchis and table grapes). Extension of storage life, disinsectisation and microbial decontamination of fruit and vegetables can also be obtained by using gamma radiation with cobalt 60 or caesium 137 or by means of an electron beam with energy of 10 million electron-volts (Mev) or less. Three acts regulate the use of these techniques for dried fruits and pulses, for strawberries and for deep-frozen aromatic herbs such as garlic, chives, watercress, tarragon and parsley (Order of 6 January 1988 on the treatment of dried fruits and pulses by ionising radiation, Order of 29 December 1988 on the treatment of strawberries with ionising radiation and the Order of 16 May 1990 on the treatment of deep-frozen aromatic herbs with ionising radiation). The provisions concerning the implementation of these techniques are applicable whatever the country in which the treatment is applied. In the case of imports, the importer must be capable of justifying that the treatments have been performed under the conditions laid down by French regulations (certificate, register, etc.). In this particular case, in contrast with the post-harvest treatments involving pesticides, importers are requested to provide precise justification of the techniques used, even if the treatment has been performed in another country. Within the framework of commercial movements of plant products, countries must take phytosanitary measures for the protection of their territories from pests that might cause damage therein. for methyl bromide, reference is made in Annex I to treatments for fresh fruits. The expression 'fresh fruits' is specified in customs tariff nomenclature 0806 and 0807 where they are defined as 'Grapes, fresh or dried' and 'Melons (including watermelons) and papaws (papayas), fresh'. Other treatment methods for fruits may enable the elimination of quarantine pests without the use of dangerous active substances. These are not therefore the subject of such detailed regulations. The method must be approved by the plant protection service through its proved effectiveness in the destruction of pests and it must be commercially acceptable, with no harmful effects on the quality of the foodstuffs treated. Cold and heat treatments are used in certain countries, in particular to control fruitflies. The regulations governing the importing of plant and plant products to Guadeloupe, Guiana and Martinique departments require cryotherapy treatment according to USDA standards for citrus fruits imported from countries not free of fruitflies (Order of 3 September 1990 completed by the Order of 3 December 1991). Obligations of this type also exist for mango imports. Such procedures are also planned for EU citrus imports from third countries but are rarely implemented as other measures are more convenient to use. protection of the users of risk products in the national or community territory. These concerns only apply to the area under the sovereignty of the countries concerned and result in the more or less strict control of the use of certain substances. 'Pest' - any species, strain or biotype of plant, animal or pathogenic agent injurious to plants or plant products.